Again, Ace is wearing an important clue. We have a winner (see comments). 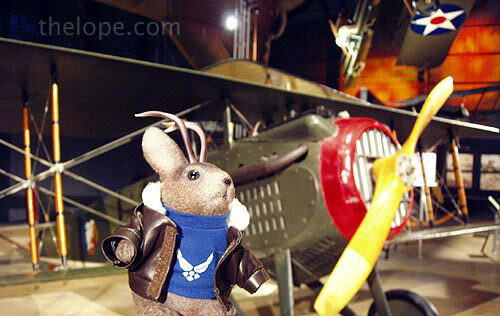 Yes that's Ace with a Spad VII at the National Museum of the US Air Force near Dayton, Ohio. National Museum of the Air Force; Dayton, OH. Wowsers! Do you know your country or what? Well, OK, at least the Ohio part of it. Surprisingly, there were no lapel pins with the old, classic USAF emblem, but they did have a few good bits of jackalope attire. I never did very well in geography, but I do excel in research. This was a tough one to find, but a great puzzle to solve.